Halton Region’s popular Spring Compost Give Away is back. Starting Monday, May 6 to Saturday, May 11, residents are invited to pick up compost free of charge as a thank you for helping to divert yard waste away from Halton’s landfill. When it comes to diverting residential waste, Halton residents are the best in the Province. Through participation in waste diversion programs like recycling, composting and yard waste collection, Halton households continue to divert 60% of waste away from the landfill, up from 40% in 2007. These efforts are important because they help conserve the life of Halton’s landfill, one of the Region’s most valuable physical assets, a savings of $15 million for taxpayers. Each year, the yard waste (e.g. leaves, garden trimmings and brush) set out for collection by residents is turned into high-quality compost at our Waste Management Site. In 2012, approximately 31,000 tonnes of yard waste was collected in Halton and the resulting compost is now ready for residents to use in their own gardens and landscaping projects. The event takes place at the Halton Waste Management Site, 5400 Regional Road 25 in Milton between 8:00 a.m. and 4:30 p.m., from Monday, May 6 to Saturday, May 1.1 Residents are encouraged to bring a non-perishable food item or cash donation, to be distributed to Halton-area food banks. Residents must also bring their own bags or containers (maximum seven per household) and a shovel in order to bag their own compost. For more information about the Spring Compost Give Away, access Halton by dialing 311 or visit www.halton.ca/waste. You can also follow Halton Waste Management on Twitter @HaltonRecycles #HaltonCompost and visit the blog at www.haltonrecycles.ca. Halton residents have always been enthusiastic about practicing the 3Rs – reduce, reuse, recycle. Single-family households continue to divert 60% of waste away from the landfill through curbside programs, up from 40%—this is one of the highest diversion rates in the Province. Since starting the GreenCart program in 2008, Halton residents have diverted 122,315,000 kg (or 269,658,095 lbs) of organics away from landfill. This is equivalent to approximately 12,000 garbage truck loads. This waste diversion rate is important because, by reducing the amount of material that is put in the garbage, Halton can extend the lifespan of its landfill. Our landfill is one of the Region’s most valuable physical assets. Opened in 1992, the Halton Waste Management Site was originally expected to last only 20 years until 2012. Through the waste diversion efforts of Halton’s residents, the landfill is forecasted to remain operating until 2040. While going from 40-60% diversion rate of residential waste is a tremendous achievement, there is still more we can do to conserve the landfill. In October 2012, Regional Council unanimously approved Halton’s 2012-2016 Solid Waste Management Strategy that outlines a goal to reach a waste diversion rate of 65% by 2016 and increase the lifespan of its landfill an additional four years. It is estimated this extension will provide a savings of $15 million to Halton taxpayers. It will also benefit the environment. 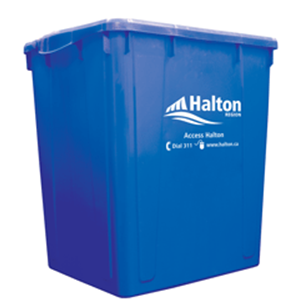 Effective Monday, April 1, Halton residents can add more items to their Blue Box, including clear plastic clamshells (e.g. berry and lettuce containers), single-serve yogurt cups, plastic plant pots and trays, empty metal paint cans (lids removed), and cardboard cans (e.g. frozen juice cans/chip cans). Information about all the new materials now accepted in Blue Boxes as well as details about where residents can pick up a new larger Blue Box are available at www.halton.ca/NewInBlue. Also starting on April 1, Halton will decrease the garbage limit and introduce “garbage tags” for garbage above the new limit. Starting April 1, residents may place three garbage bags/cans or less at the curb every other week. More than three garbage bags/cans will require a garbage tag. Complete details about the new garbage limit, including information about where you can pick up or order complimentary garbage tags are available at www.halton.ca/GarbageTags. Currently, 85% of residents place three garbage bags or less at the curbside every other week. That means, the vast majority of Halton residents won’t need to participate in the garbage bag tag program. By recycling and composting more, residents will have even less waste going to the landfill, which means the landfill will last longer. Together we can continue to make a difference. Currently, 95% of single-family homes place a Blue Box curbside for collection every week. The average garbage bag in Halton contains 23% GreenCart materials, 13% Blue Box materials, and 16% other plastics. Think about how much garbage will be reduced if all these items are composted and recycled.